One of the many things I like about the sport of duathlon is how quickly things can change in a race, leaving us all guessing at the results until the final run is done. 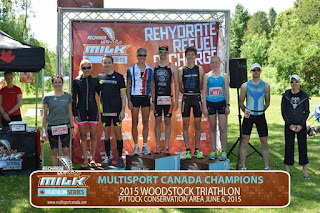 That's what happened Saturday at the first Recharge with Milk / MultiSport Canada event of the year, its Woodstock weekend. 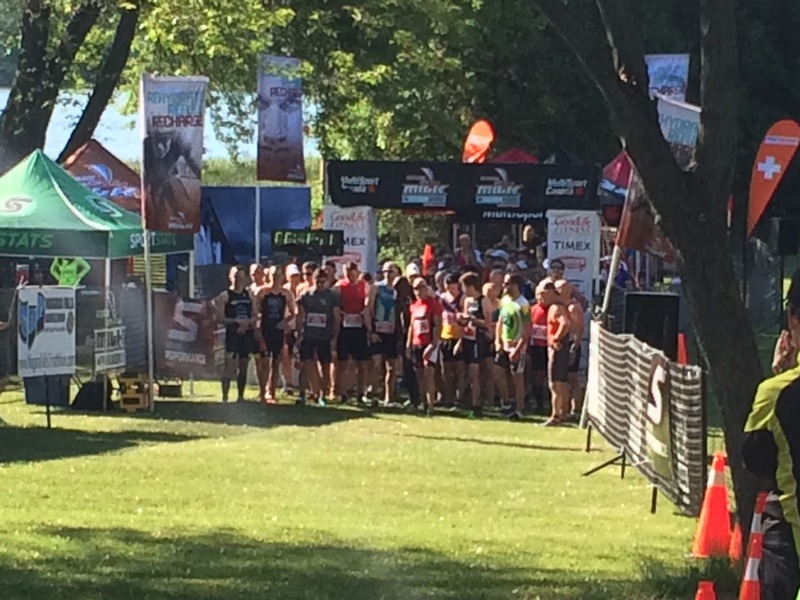 With a crowd of 93 duathletes competing, it was a popular duathlon. This is my traditional season opener race. The town almost feels like home and I've built a routine around getting to events in that area. 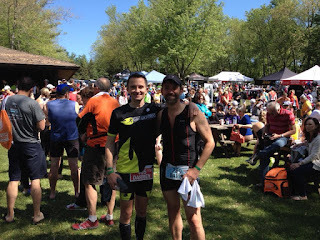 This time around, Rob came to watch, which added an element of fun to the trip, as I usually travel alone to duathlons. Somewhere on the highway, happy we're not stuck in traffic! In the days leading up to the race, I mentioned to Coach Roger that I had been feeling nervous about it. Last season was a break out experience for me, with the sensation of pleasantly surprising myself with my results. This season, I have a full year of training behind me - as well as those past positive results - which led to some self-created pressure. 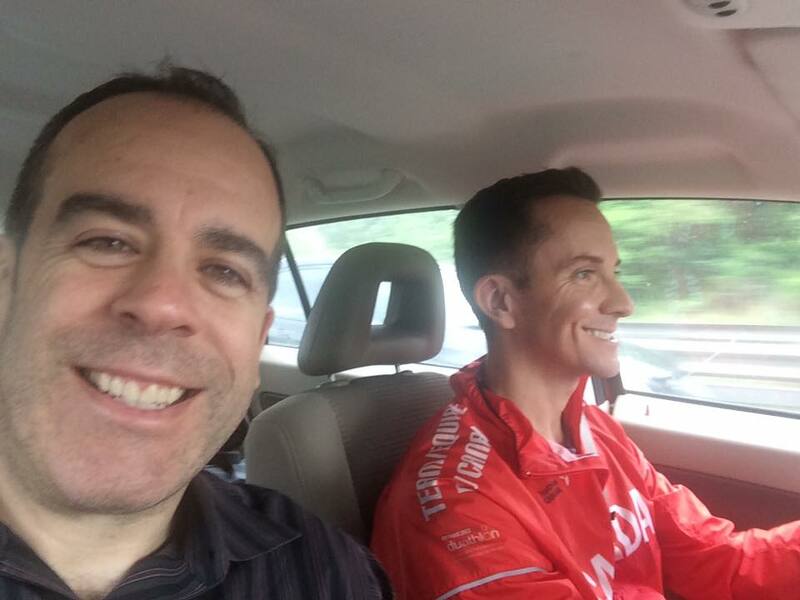 With his encouraging words, I focused on my number one objective in this sport: having fun. As an added bonus, my dear friend Mahnaz from London, Ontario, would be doing her first duathlon in Woodstock. She is a runner extraordinaire, a dedicated champion of human rights, a social media empress and a ball of positive energy. She is working through a bucket list of experiences this year, including a 50 k ultramarathon in July. Impressive! Having her at the event promised it would be lots of fun. Rob and I arrived in Woodstock on Friday evening and checked into my usual hotel, before heading out for dinner. Just like last year, the hotel assigned me with a room that looked onto an alley frequented by late night party-goers. Given the paper thin walls and the direct venting to the outside, noise travelled, I took longer than expected to fall to sleep and awoke several times throughout the night. Waking up in the morning, we made good time and got to the race site by about 7:20 a.m. Mahnaz had already arrived after getting lost a couple of times -- "Isn't this your neck of the woods?" I asked, smiling -- and we greeted with hugs in the parking lot. After registering, I secured the best spot on my bike rack at the very end and facing the exit. Perfect. Then my bike fell over and knocked down the rack. Whoops. I fixed that quickly. I took time to head out for a warm-up ride, testing out my new Felt bike as well as the new cassette on my disc cover wheel. They worked like a charm. Having never owned or even rode a fully carbon bike, I'm in awe how silent and smooth it feels. I'm still stung by the experience of having my last bike stolen, but am grateful that I was able to find this beautiful ride for a great price. Returning from the warm-up, I spoke with Mahnaz and then she went out for a ride as well to test her gears on the hills. It's a good tip for this race, given the sharp hill out of the transition area. As usual, time flew and soon the crowd of duathletes lined up for our mass start. Mahnaz and I hugged each other, wishing each other good luck and promising to keep smiling on the course. I looked at the other athletes, wondering what would happen over the course of the next hour. Two strong racers I recognized, Spencer Summerfield and Chris Marentette, had both been dealing with injuries in the days and weeks prior to the race. Garvin Moses toed the line, looking primed to go as usual. Jeremy Carter and James Delodder stood in the front, as did quite a few new (to me) faces. 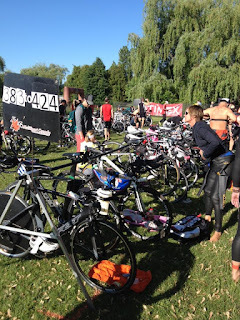 When the horn blew, the athletes surged and I found myself in a new situation: basically leading the pack. My race plan was to go out hard, drop some people and see what happened. Garvin Moses, Joseph Hunter and I pushed a pace of between 3:10-3:15 for a couple hundred metres, neck and neck. Eventually, Joseph held the pace and Garvin fell back, with me in the middle. That placing remained until after the halfway turnaround point, when a hard charging Steve Beasley caught me on the trails, passing and offering an encouraging greeting. I held onto third place and actually came close to toppling my 5 km PB of 18:31. Entering T1, Joseph led, followed by Steve and me. I eyed the straps of my new (to me) aero helmet and it went on smoothly. Shoes off, go! Heading up the hill out of transition, I mounted my bike with a semi-flying leap. (Note to self: practice that move again, you're getting rusty.) My plan was to pedal up the hill with my feet atop my shoes and then strap them in. In the heat of the moment, I decided to strap in on the hill. Not a good idea and I wobbled. 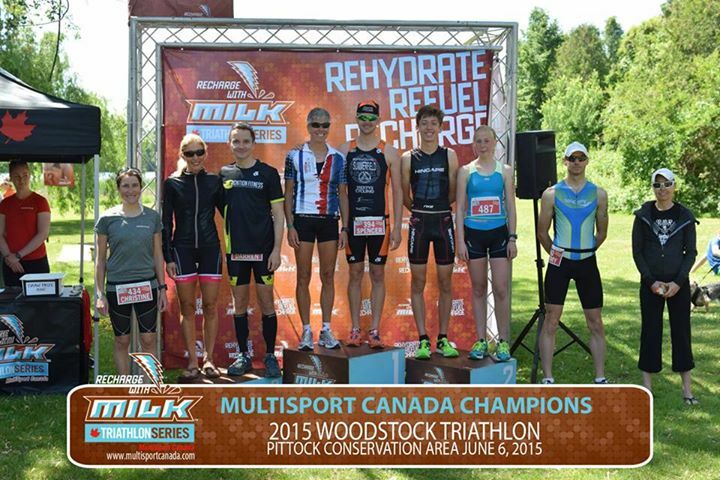 Thankfully, I remained upright, although a couple of cursing triathletes passed me while I regained my composure. Out on the bike course, wind pummelled us from all angles. I was glad for the Retul bike fit I received recently from Sweet Pete's, which put me comfortably into a more aero position. I leap-frogged the triathletes on the north-bound uphill, making decent progress, until I was passed by Spencer, somewhere around the 5km mark. D'oh! He was pushing some tough gears and I decided to use him as a pace bunny, but I didn't keep up and he moved past some triathletes, putting a buffer between us. Near the halfway turnaround, Jeremy rode past and I doubled down on my determination not to lose him, knowing that I was now in fifth place. 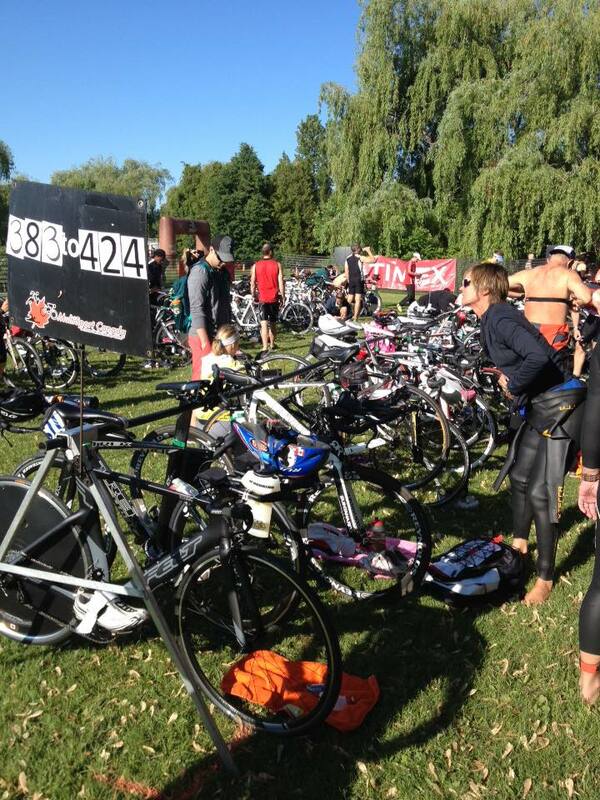 I managed to keep him within sight as he passed triathletes. 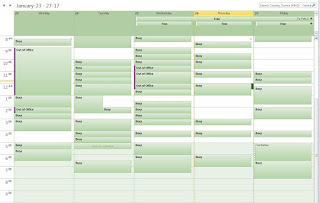 I played catch up. I was confident I had the strength to do it, but needed to just go for it. (Next note to self: be more assertive, while still respectful, in passing.) Somewhere on this half of the ride, I passed Steve. About one kilometre out from transition, I caught up to Joseph. If I recall correctly, he was motoring along on a road bike - impressive! We jostled for position alongside a triathlete and following the dismount marking, joined a line of racers heading into transition. I racked my bike first and took off, glancing at Joseph as he put on his shoes. At a moment like this, one wonders if their opponent has done brick training. It appears he had. Alas, Joseph soon caught me. I told him he was doing a great job. He offered to work together on the run, saying "They're coming for us." Kind of an eerie but fun thought -- reminds me to try out the Zombies, Run! running app for iPhone. We were now neck-and-neck in third place, but I couldn't sustain his pace and Joseph inched ahead. Soon Spencer approached, moving in the opposite direction. 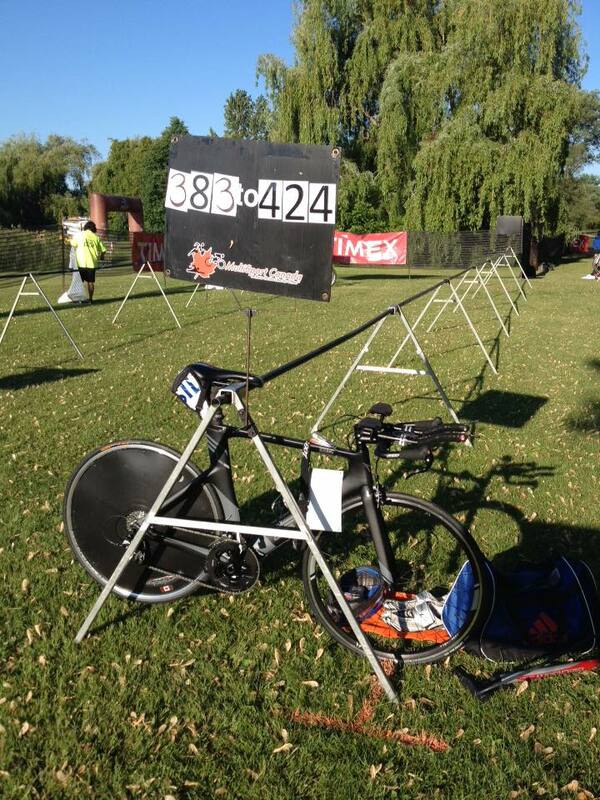 He had posted a blistering 33:16 bike split and was on his way to a well-earned first place. The run turnaround arrived sooner than expected. On the return, I saw Joseph passing Jeremy ahead of me while a pack of duathletes chased us in pursuit. My mind played tricks on me, encouraging me to slow down, but I kept repeating my mantra, which helped me pull off a faster average pace than on the first run. 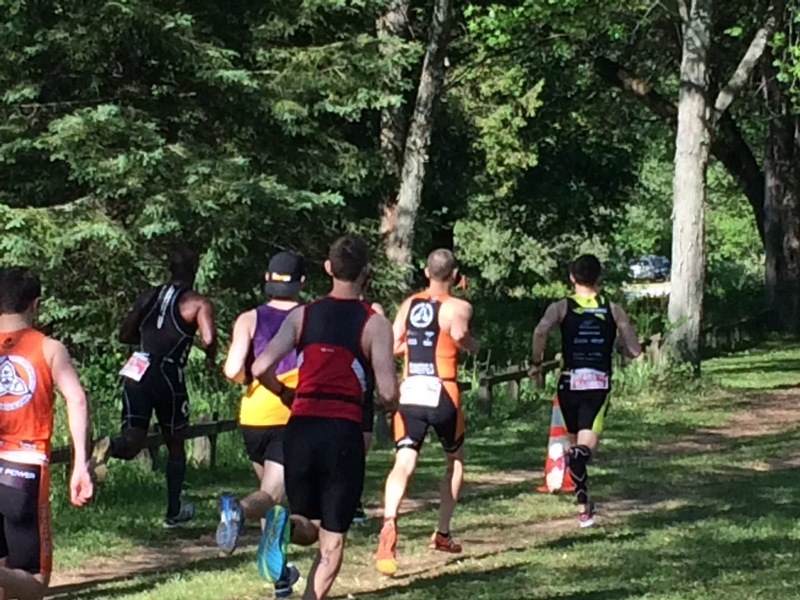 About 100-150 metres out from transition, I pulled in behind Jeremy and made my move, surging to make the pass. The "smiling assassin" (as Coach Roger calls me) returns. As the results came in, familiar faces netted podium finishes, with Jeremy taking second in our age category and Garvin third, James taking first and Coach Roger fifth in theirs. Mahnaz rocked her first race, finishing in under two hours and with a smile on her face. The bike course was tough but she pushed through it and earned a solid finish. And like any true multisport athlete, she is already setting her next goal: a sub-1:30 finish! Let's hope she's hooked and we see her out at more MSC events! A smiling Mahnaz at the post-race picnic. Hanging out at the finish line is kind of like a family or class reunion, and you run into all kinds of people. I found long-time friend David Graham, who had competed in the triathlon. 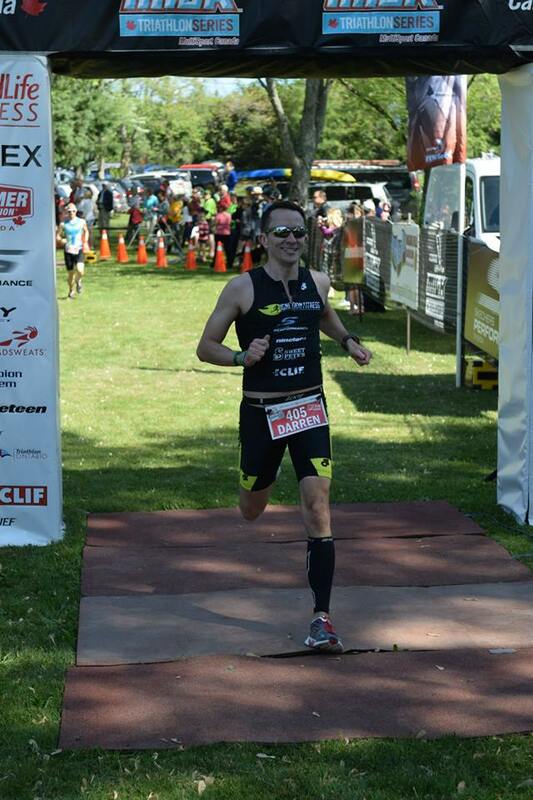 He's a marketer by day and multisport athlete by night. Dave is a regular participant in the Tri-Adventure, a really cool multi-day, multisport charity event that combines running or cycling, canoeing and cycling to raise money for an orphanage in Africa. It is a small event, almost entirely volunteer-run and different from the larger, corporate fundraisers out there. If you're interested in a new challenge and giving back to our fellow citizens of this planet, check it out. Enjoying the sunshine and festivities with Dave. All around, this was a hard fought race for me as I threw in some new tricks on the run and bike. The result is about a 4.5 minute improvement over last year's results, with gains spread evenly across both disciplines. I leave the race weekend feeling invigorated for the season ahead, having tested out my strength and beat back early-season nerves. 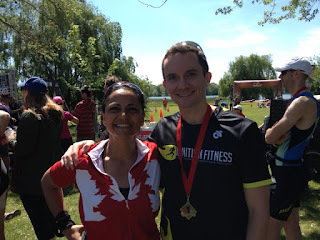 Most importantly, I left feeling blessed to be a part of this inspiring and friendly duathlon community, brought together by the team at MultiSport Canada. Until next time!